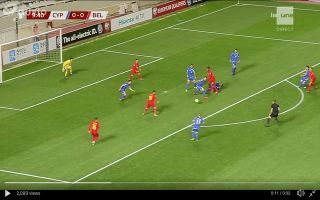 Chelsea superstar Eden Hazard celebrated his 100th appearance for Belgium by scoring a lovely goal with a tidy finish. Belgium are facing minnows Cyprus in a Euros qualifier. Hazard opened the scoring for the Red Devils just 10 minutes into the clash, Belgium got the ball in the box after a superb long pass by Tottenham defender Toby Alderweireld, Chelsea striker Michy Batshuayi latched onto the ball and held it before it spilled into the path of Hazard. The Belgian ace fired a lovely first-time finish into the back of the net. With Belgium coming off of a third place finish in the World Cup and Hazard being at his goalscoring best, could Martinez’s side be a serious threat to France at Euro 2020.